Hip pain can be experienced in the buttocks, side of leg, groin, inner thigh, and sometimes in the knee. If you have pain in one or more of these areas and difficulty walking, squatting, climbing stairs, crossing the legs, getting in and out of a chair or the car, or putting on shoes and socks, then chances are you have hip pain. The hip is designed to have a lot of motion in all directions, and the muscles which limit its motion are often the deepest and “hiding,”- like the psoas, piriformis, and obturator muscles. But don’t worry,- good hands-on techniques and appropriate stretching can help resolve the tension. Strengthening the hip muscles is just as important as stretching them, especially since every step you take loads the hip. So if the appropriate muscles aren’t absorbing the force, then other muscles and the joint will absorb the force, and that usually leads to pain and inflammation. Strengthening the core is super important, too. The core is right above the hip, so it has a great power to unload the hip, give us greater balance, and make all the body parts work together more efficiently. Try this: Stand in front of a mirror. Look at your pants line. 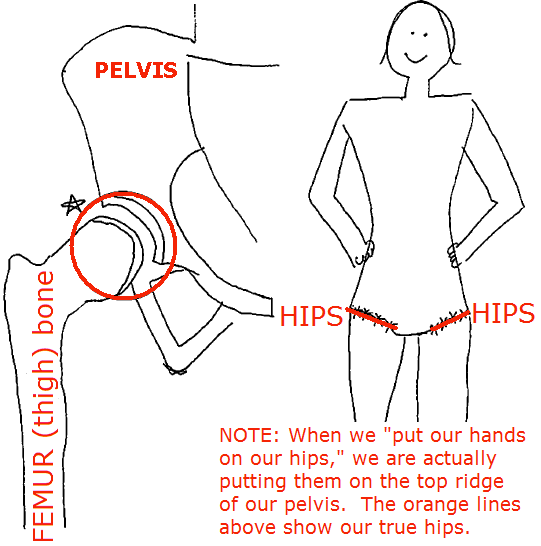 Does your pelvis look level? Now stand on one leg; does your pelvis still look level?, or did you lean to one side or twist? It should still be level. This test is a great indicator if all of the muscles are coordinating accurately to give you good strength and balance and if your hip is at risk for injury. Locating the tight muscles, the weak muscles, and training proprioception (where you perceive your body is in space) can allow you to stand evenly on one leg, or go evenly up a high step, or squat, or run without pain. Call today for a hip pain treatment appointment with Anita!